Which tool for this bottom bracket adjustable cup? This is on a early/mid 90's (I'm guessing) Trek 800 Mountain Track. 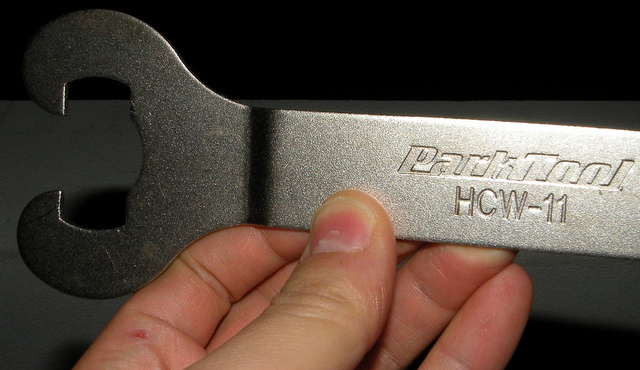 Large, good-quality adjustable ("Crescent") wrench. The corners of the jaws need to square to grip the flats on the cup. It shouldn't need that much force to turn. It takes a 15mm (usually) open end wrench, or as Jeff says an adjustable. There is a tool made for the job, but it's relatively expensive and not so easy to source. You shouldn't need the specific tool unless trying to remove one that's rusted in. I use a cone wrench, and if I have trouble with keeping it on, I stack a bunch or washers onto the spindle, and use the crank bolt and washer to lock the tool to the cup. I always use 16mm cone wrenches on these when the crank is in place, and one or two 5/8" open-end wrenches with the crankarm outta the way. I believe they are all 16mm (5/8"), What I think FB meant btw. You can easily apply some serious torque with two wrenches. 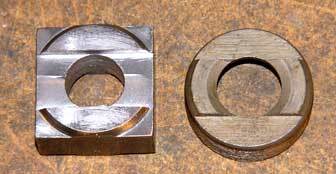 Funny coincidence, but I was JUST adjusting a bb with the somewhat-similar 25mm hexagon protrusion that is about as common as this type. Last edited by dddd; 09-03-12 at 06:06 PM. I believe they are all 16mm (5/8"), What I think FB meant btw. Probably, I don't bother trying to remember details like wrench size. When I face a job like this, I select the wrench that fits, then promptly forget which. I usually use a 12 inch crescent on these after removing the cranks and haven't found one that wasn't resonably easy to remove after removing the lockring these usually only take about 20lbs force to get moving. As infrequently as I work on these, I would have forgotten too. Except that the 5/8" wrench also fit made the size "memorable". I don't like adjusting bb's with the crankarm in place, but often I find that a newly-rebuilt cup/cone type bb will require one or two minor tightening adjustments before settling into a long, happy service life, so it's nice to be able to do the adjustment with the crankarms in place. And if those are cottered arms, fugettaboutit., I'll just drip Phil oil in and adjust with the arms cottered for life. I had to use cone wrenches, 2 of them, 17mm, to remove a French pedal the other day. Good thing they're made of the best metal. Anyway, I kind of seek alternatives to Park tools. Something about their trade-marking the color blue, it's just too "Wall Street". I mean, how many colors are there? Should their also be a similar limit on how many tool brands can exist in the market? What's next, someone will trade-mark silver and black? If it doesn't come loose easily with a crescent wrench or similar don't bother getting a specialized too. Just grab the threaded portion with visegrips and yank it out of there, put in a fresh one. Puill out the fixed cup as well (bike shop can do or Google sheldonbrown fixed cup. Last edited by cny-bikeman; 09-04-12 at 10:09 AM. I kind of seek alternatives to Park tools. Something about their trade-marking the color blue, it's just too "Wall Street". I don't have this particular tool, (I have the Park one.) but I have bought other stuff from Mark and highly recommend his services. Thanks everyone! We do have cone wrenches and a big crescent wrench somewhere. I'll report back if I have any trouble or notice anything particularly interesting. The bike is in pretty bad shape, so I reckon I'll be back here in Bicycle Mechanics with more questions as I go along. About 70% of the bikes I build have this bb setup. The nice part is that they're easy to adjust with the crank arms in place and I can use the extra leverage of the crank arms to detect any play in the adjustment. One bad part is that they always need adjusting out of the box and the Chinese factories are torquing the lock ring to insane levels. Another bad part is that they're using really soft metal for the lockring. I've found using a 10lb dumbbell as a dead-blow hammer on the lockring wrench is the best way to loosen it. There's lots of mass in the dumbbell so you don't have to take a big swing that hits the tool at an angle causing it to slip off the notches. Is my frame poorly constructed? Can't center rear wheel perfectly!